Today, there are a lot of informations. One of these is spatial data such as land use, landform, street, river, telephone line, water supply, electronic supply, demographic, and etc which datas must demonstrate on map as it can understand easily and help decision marker decide actually. 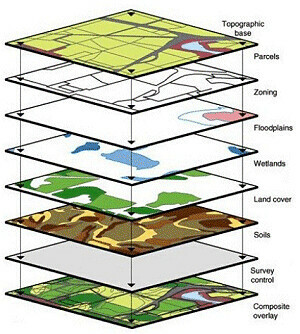 In the past, GIS was used to study about environment but presently it is applied to business. integrates hardware, software, and data for capturing, managing, analyzing, and displaying all forms of geographically referenced information. What business uses GIS ? This example is advantage for insurance company which will use with thai agriculture. The United States Department of Agriculture's (USDA) Risk Management Agency (RMA), based in Washington, D.C., helps food producers manage their business risks through effective market-based risk management solutions. As part of this mission, RMA manages the Federal Crop Insurance Corporation (FCIC) to provide American farmers and ranchers with crop insurance. RMA develops and approves the premium rate, administers premium and expense subsidies, approves and supports products, and reinsures the private-sector insurance providers through the Standard Reinsurance Agreement. In crop year 2009, RMA managed nearly $80 billion worth of potential liability. FCIC relies on actuarial maps for crop insurance to designate different areas within a county that have varying amounts of risk due to factors such as flooding or highly erodible soil based on type. These maps are used by 16 private-sector insurance companies that sell and service FCIC policies. While RMA has been using hard-copy actuarial maps for decades, it had no way to validate whether an agent or insurance company was reporting accurate claims or the claims reported were in the correct areas. Inaccurate reporting skews the adjustment of the risk rate for producers and can create unnaturally high premiums in areas where it is not necessary. Because of this, RMA incorporated GIS to manage the information and analyze the program. Using GIS has helped RMA save $20 million a year and lower premiums for regular rated land, which in turn reduces the government subsidy on insurance across all acreage. Since most federal agencies are standardized on Esri software and data formats, RMA chose to incorporate Esri software in the early 2000s to begin the FCI-33 Actuarial Map Digitizing Project to convert hard-copy maps, using aerial photos and USDA Common Land Unit data, into GIS. This process took several years, and at the end, RMA's 10 regional offices digitized more than 1,500 maps into shapefile format. Managing such a large number of digital maps was difficult, prompting USDA to upgrade to ArcGIS when it was released and use a personal geodatabase to manage the digital files. The geodatabase allowed it to aggregate the maps into 10 more manageable feature classes instead of the 1,500 stand-alone maps. In 2008, RMA upgraded to ArcGIS Server, which allows it to more easily share the data throughout its regional offices using a central server without keeping copies of maps on regional office computers. RMA uses the digital actuarial maps to cross-check and approve maps generated by the regional offices. "The ability to validate these automatically instead of by hand has saved us so much time," says Greg Oetting, risk management specialist, USDA-RMA, Topeka Regional Office. The actuarial maps for 2010 and previous years are published as PDF files on the Internet for the insurance companies to view. 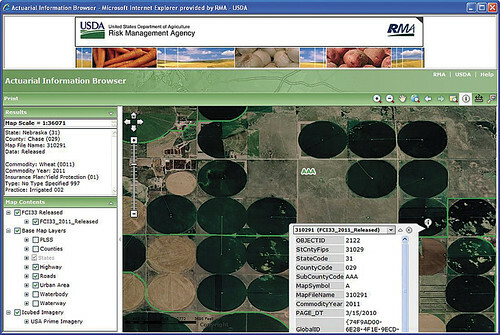 In 2011, RMA rolled out an interactive map viewer that is hosted publicly. Insurance companies have access to the data and can host it internally. "This will be a real time-saver to RMA," says Oetting. "Creating the map viewer means we don't have to spend time and man-hours building out and proofing 1,500 individual PDFs." Over the last few years, RMA has been incorporating more satellite imagery into the program. "A majority of the maps we create are located in flood-prone land, which has a higher risk than any other insurance peril," states Oetting. Unlike a Federal Emergency Management Agency map, however, where land is designated as a flood risk or not, RMA is interested in whether a certain land floods only during the specified growing season. Floods that occur in the winter months on a producer's land won't have any impact on the insurance policy for crops planted in the spring because the land is not being used for crops at that time. Satellite imagery provides a good source to find the extent of floods. "Flooding near major rivers like the Mississippi and Missouri are easy to determine," says Oetting. "But it's harder to determine flood extent and frequency on smaller tributaries. Using GIS to overlay satellite imagery provides an accurate visual of where exactly the flood happened." RMA can check areas that might be designated as high risk when, in reality, they weren't flooded during the actual growing season. GIS is also used to update maps quickly and help RMA with the appeal process. If a producer doesn't agree with a particular rating class, he can appeal it. For example, a producer may argue that the land he is cultivating is not flood prone. The ability to pull up satellite imagery for the day the river was at its highest during the year and see that, in fact, there was no water on the producer's land allows RMA to rectify the misclassification. Having the maps standardized across the country also helps with creating fair and equitable pricing and makes the process transparent to the producers. RMA has created handbooks for each office so it can standardize editing performed on maps. Using its rate review mapping tool, RMA can easily visualize how rating components flow across the nation. This is important, since where crops are physically located dictates the type of coverage farmers are offered. Insurance offers are based on the crop yield for a particular parcel of land. This information is garnered from the producer's production history, the harvest-time futures price set at a commodity exchange before the policy is sold, and the type of crop planted. The policy will pay an indemnity if the combination of the actual yield and the cash settlement price in the futures market is less than the guarantee. Using GIS to drill down past the county designation, RMA can designate subcounty insurance offers that are considered high risk, which excludes the insurance history from the calculations that are used to determine the premium rates for the entire county. The end result is a premium rate decrease for most producers, as more high-risk acreage gets reported correctly. In the past, reviewing premium rates involved colored pencils and large pieces of construction paper on which RMA staff would manually write down all the components of the premium rate by county. Now, GIS can be used to thematically map areas and look for the anomalies. For example, if rates are going down all over Kansas except one county, RMA can not only see the discrepancy quickly but also investigate why. "Trying to answer the why was impossible before," says Oetting. "We would have to find all the documents and papers and then send someone out for a manual check just to chase down the answer. With GIS, everything is linked and very easy to find." In cases of suspected fraud or abuse, RMA uses imagery to examine a producer's crop for a particular time frame and reconstruct the growing season. Using imagery allows RMA to perform, in essence, forensic remote sensing at any location to see what actually happened on the ground. 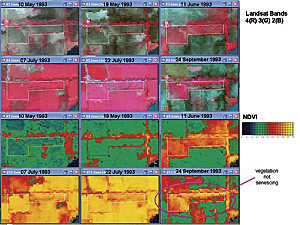 RMA can pull up the imagery and overlay the digitized map of the farm field boundary. RMA agents can see if the land has been planted as the producer said it would. Since images are captured every 16 days, gathering this visual evidence is important because it provides the evidence needed in a sound, scientific protocol. "The vast majority of farmers follow the rules," says James Hipple, PhD, physical scientist, USDA-RMA, Office of Strategic Data Acquisition & Analysis. "Remote sensing and GIS are part of the toolbox RMA utilizes in creating an actuarially sound agricultural safety net for America's producers while simultaneously minimizing the amount of fraud, waste, and abuse in the program." When business use GIS for decision making, it safe time, money, and actually data.